Mention “gold” and thoughts of jewelry and bullion usually come to mind. 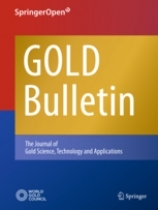 Published by the World Gold Council since 1968, the Gold Bulletin is the first journal dedicated to research on gold science, technology and applications. The World Gold Council describes itself as “the market development organization for the gold industry” and is the sponsor of the quarterly Gold Bulletin. The journal is accessible through SpringerOpen, with open access fees for the journal covered by the World Gold Council, so there are no publication charges for authors. The Gold Bulletin provides research, reviews, conference reports and patent highlights—information of interest to “chemists, physicists, engineers, metallurgists, material scientists, biotechnologists, surface scientists, and nanotechnologists in industry and academia.” Recent articles covered “Effects of Au nanoparticles on thermoresponsive genipin-crosslinked gelatin hydrogels” and “Gold highlights at the Third International NanoMedicine Conference, in Coogee Beach, Sydney, Australia, 2–4 July 2012” with “Bringing home the gold medals,” a tip of the hat to the Olympic Games in London. A must-have for metallurgists and serious metals researchers.